Preciously framed, very decoratively ornamented. Dimensions framed: 40 x 40 cm (15.7 by 15.7 in). Fine and very charming watercolour in excellent academical style and delicated coloring. 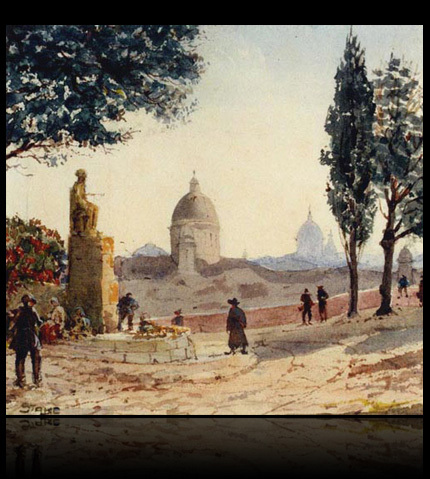 Between 1915 and 1920 presumably locally painted in Rome. 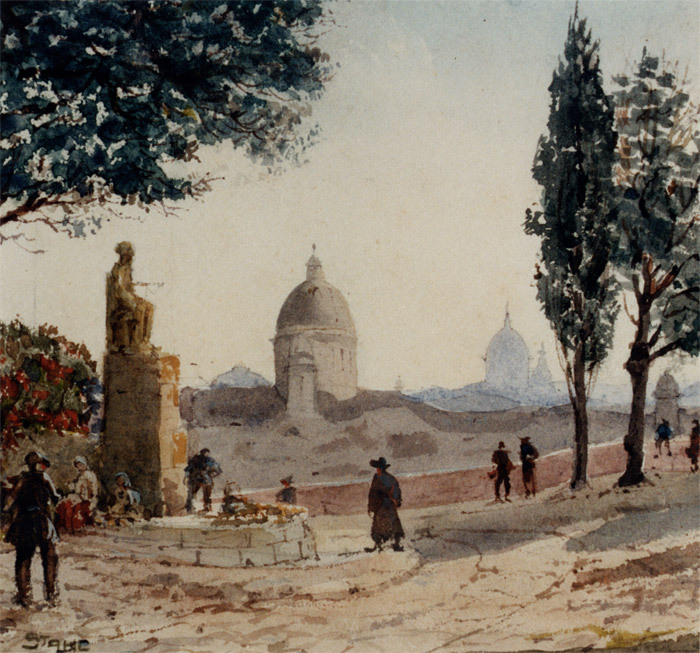 Depicting one of the beautiful large parks in Rome and flower vendors in front of a monument with fountain so as a view over the city with the silhouettes from the buildings of St. Peter. The artist studied 1878 at the Munich Academy as a pupil of Wilhelm Diez, Ludwig von Löfftz and Gyula Benczúr. As early as Twenty-one years old he moved in his own studio. From 1886 until 1898, he been active in Berlin, there 1892 co-founder of the oppositional painter association XI, then he went for a few years to England, in order to study the Pre-Raphaelites, and from 1904 until 1913 to Florence, where he intensively studied the works of the early Italian Renaissance, like Sandro Botticelli and others. At 1914 he returned to Munich and in the same year he went to Rome. He was a member of the Society of German Watercolour Painter (with the honorary diploma of the Dresdner watercolor academy) and the Munich Secession. He began his remarkable career as a painter of impressionistic genres and developed his own characteristic style influenced by the Italian Quattrocentisto and English Pre-Raphaelites. Works by the artist can be found in many major museums and galleries including Aachen, Suermondt-Ludwig-Museum; Darmstadt, Hessisches Landesmuseum; Kaiserslautern, Pfalzgalerie; Leipzig, Museum der bildenden Künste; Munich, Neue Pinakothek; Munich, Stadtmuseum. Literature: Vollmer, vol 4, p. 339; Thieme-Becker, vol XXXI, p. 446; Friedrich von Boetticher, vol II / 2, p. 797; Münchner Maler im 19. Jahrhundert (Munich painters of the 19th Century), vol 4, S.203, fig 302, 304, 305. Impressive fine and very charming watercolor in beautiful original condition, slightly foxing, altogether not disturbing. Further details and price on request.